In 4-quart saucepan, heat 1 cup water to boiling. Add potatoes. Cover; cook over medium heat 10 to 12 minutes or until almost tender. 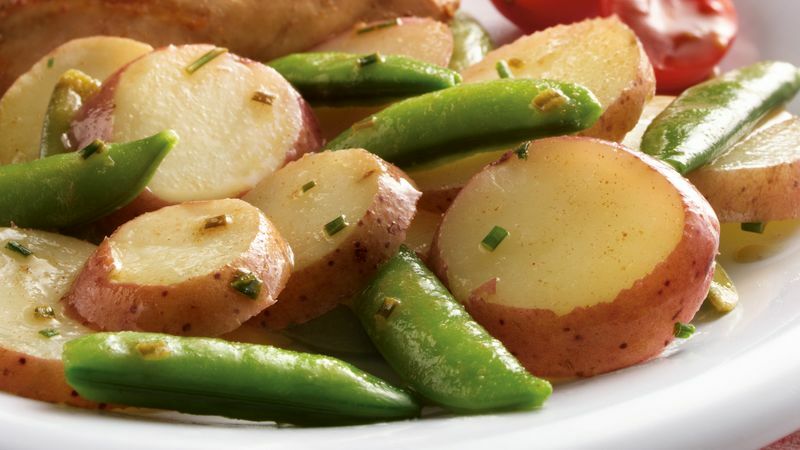 Add sugar snap peas to potatoes. Cover; cook 5 to 8 minutes or until peas are hot and potatoes are tender. Drain; return to saucepan. Meanwhile, in 1-quart saucepan, cook butter over medium heat, stirring frequently, until it begins to brown. Stir in 3 tablespoons water, the lemon juice and bouillon; cook about 2 minutes, stirring occasionally, until hot. Stir in chives. Pour browned butter mixture over cooked vegetables; stir gently to coat. If desired, season to taste with salt. The French invented the technique of cooking butter just until it's light hazelnut in color to give food a distinctive flavor. To get the most juice out of a lemon, let the lemon come to room temperature before squeezing.